In order to provide you with most flexibility in the booking of your course, guided climb, or trip, we have group, limited group size, and private rates for rock climbing, ice climbing, mountaineering, and ski mountaineering instruction and guiding. You choose how you would like to book your course, activity, trip, or guided climb. Jump to Rate Tables Now. We have special group rates for our Basic Ice Kraft & Introduction to Rock Climbing Courses, frequency discounts, and reduced rates for large family outings and non-profit organizations like the Girl & Boy Scouts, YMCA, Spiritual Organizations, and many other non-profit educational organizations. Please call for details on special group discounts and frequency discounts. In the rare event that conditions do not permit camping, or you would simply prefer more comfortable accommodations indoors, we would be delighted to arrange them for you. Although nothing compares to the delight and ease of working with guests in a one on one or one on two environment when preferred, we excel in having the decades of guiding experience, training, and skill essential to safely, efficiently, and enjoyably guide large groups on most routes. 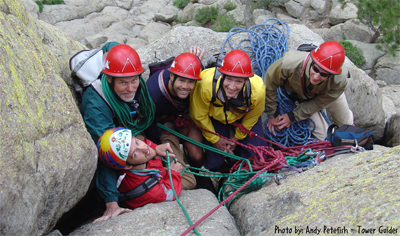 A skill that comes from decades of working as a guide for a living, and one that can result in substantial savings for you and your group while allowing you to enjoy the dynamic of climbing with your friends and/or family members. * This is the course for you if you just want to get your feet on the Rock for the first time or you have very limited experience. * Minimum of two participants. * This Course is only Available at Devils Tower Wyoming. * We do not accept credit cards. Initial Deposits to secure trip reservation(s) can be made by check, but final trip fee payment upon arrival prior to starting the course or guided climb must be made with cash. Tower Kraft Rates apply only in conjunction with a Summit Climb booking of Devils Tower. Rates include all technical climbing gear including rock or crampon compatible boots. We will gladly send you a complete recommended gear list for your activity of interest if you just complete the form found here. Since rates are subject to change, please call us at 307.756.3516 for our current rates, and/or you can complete the form found here requesting this information. We would like to hear from you. Above Ouray Ice & Tower Rock Guides is an Equal Opportunity Service Provider and Above Ouray Ice & Tower Rock Guides is a permittee of the Grand Mesa, Uncompahgre, and Gunnison National Forest. All or part of this Fully Insured Operation is conducted under Special Permit on Public Lands by the U.S. Department of the Interior BLM & NPS Agencies; U.S. Department of Agriculture USFS Agency, & other State Agencies.